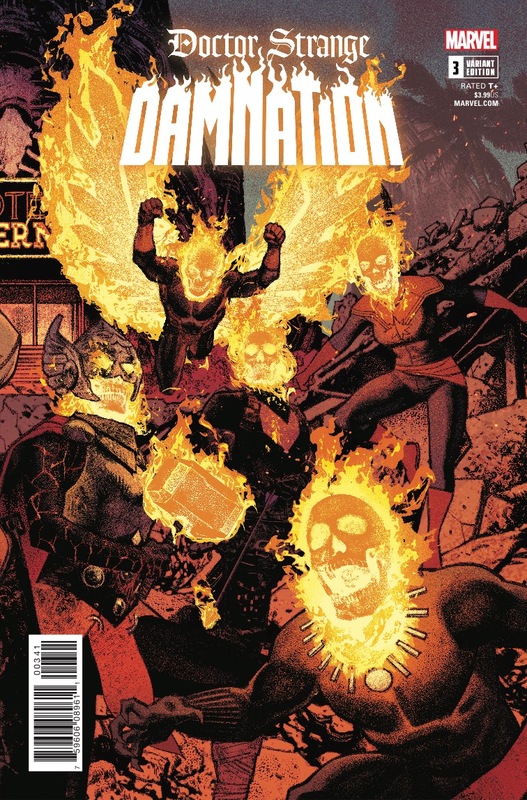 Doctor Strange: Damnation #3 Review – AiPT! Blade and Moon Knight put on a great show. “Damnation” is a four-part series so you know what that means, don’t you? The penultimate issue is here! That means we get all the setup and build up to the big finale in a story that has a supernatural team like no other. Aside from this being a mini-event (the stakes are huge!) this story appears to be building up Johnny Blaze AKA Ghost Rider in a satisfying way. Plus we get primo Blade mixing it up with all-star heroes. Wong has facing an adventure he’s never taken before. This is one of the first chapters in the story that doesn’t retread much at all. A win! The story does start with a flashback to Wong preparing to talk the heroes into going to battle for Doctor Strange, but this helps develop Wong’s angle. He’s no leader and it’s a nice reminder that this team may not be as prepared as we’d like. This is one smaller scene amongst many smaller and quieter scenes taking place in the bigger war. That effectively allows Nick Spencer and Donny Cates to give each character a meaningful moment (well maybe not Iron Fist). Truth be told Blade and Moon Knight get the best moments in this issue. Blade is so damn calm and collected and the creators do a good job making him look impressive in the face of impossible odds. Then you have Moon Knight, who is a bit crazy adding some levity to the the comic as he attempts to lift Mjolnir. Szymon Kudranski draws some rather cool Ghost Rider scenes. The flames look great, especially since the skull is so subtle and yet constructed under the yellow and oranges. Moon Knight also has a similar effect since there’s not much detail in his mostly white masked head. Energy blasts in general look great, like a scene where Doctor Strange blows flames at Wong, who protects himself with a green shield. Oh Moon Knight, you so silly. The art is going to be a dealbreaker for many. It’s sketchy and sometimes unfinished looking especially with human faces like Johnny Blaze. Iron Fists’ face also looks stiff and odd though he’s barely in the book. Speaking of which, for a team book it’s grossly underusing its team. Man-Thing, Elsa Bloodstone, and Iron Fist are more background fodder than anything else. Scarlet Spider, who made a triumphant introduction last issue has one line of dialogue. It makes you wonder why this team needed to be formed at all (probably so their respective books could tie-in?). The story isn’t progressing much at all either. The bad guys get beaten back just like they did in other chapters of this story, but nothing seems to work. The end is rather anticlimactic too essentially raising the stakes for the heroes, but with no real rules or understanding of how the battle can be won it’s hard to care. They’ll win, but at this stage of the game it’ll probably be via dumb luck. Come for the fun character beats, but don’t expect much progress in the story. Blade and Moon Knight fans will especially like this one, but it’s clear the story is holding back for the big finale. Not the greatest chapter in the story, but it is saved by solidly entertaining character moments.